In life Saint Olaf was a violent and brutal warlord; a killer Viking who lived 1,000 years ago. Yet he’s a Christian saint, is known as the Eternal King of Norway, and even the axe on Norway’s coat of arms is his. When he was alive he was known as Olaf the Fat; when he was dead he became Olaf the Holy. In life he raided, extorted, killed and plundered and converted people to Christianity as he went about his deadly business. After he died in battle many hagiographies were written about him including The Passion and the Miracles of the Blessed Olafr. One of his many miracles was said to be killing a sea serpent and throwing it onto a mountain where it’s still said to be visible on the cliffside. And we’re really supposed to believe that? Why is there such a contrast between his actual life and his afterlife in literature and culture? The answer is power. Pagan Scandinavian kings traditionally claimed their right to rule by claiming they were descended directly from the Norse god Odin. They faced a practical problem with that claim because they couldn’t carry on making it to their gullible and superstitious people after converting to Christianity. They transferred this idea of their divine right to rule from being descended from Odin to being descended from a saintly king in Christian times instead. The kings of Norway promoted the cult of St. Olaf to justify their own rule. We still have similar primitive and superstitious views in the United Kingdom with the ‘divine right of kings’ saying that Queen Elizabeth II (who should be Queen Elizabeth the I in Scotland) has God’s mandate. This ‘by the grace of God’ means she claims her royal and political legitimacy directly from God to a gullible and superstitious people. I think I’d prefer it if she claimed legitimacy from Odin. 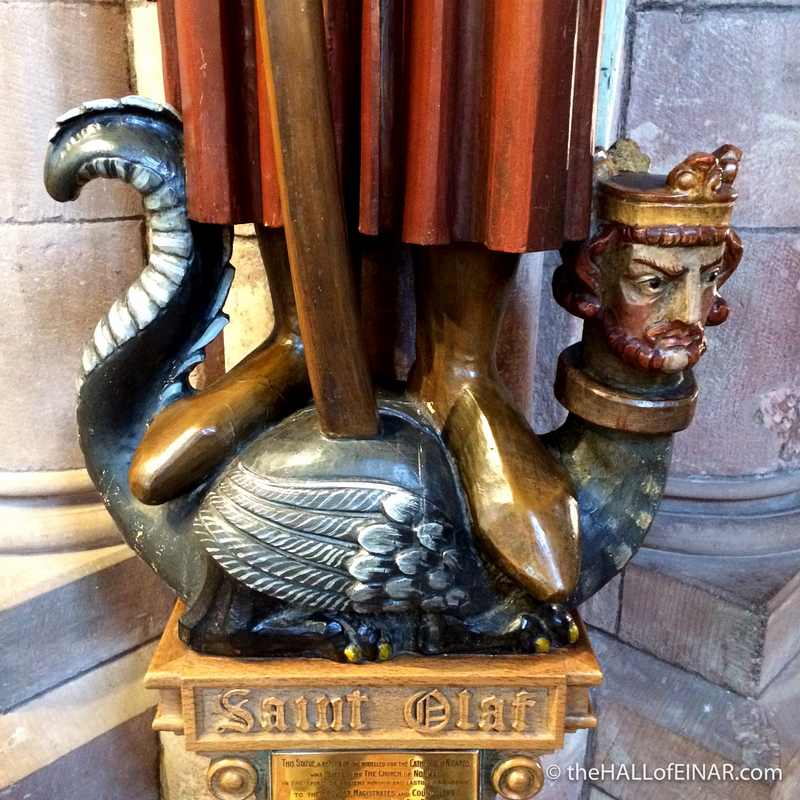 Here’s St Olaf in St Magnus Church. His feet and the handle of his axe are on a strange figure. Maybe it’s that serpent he killed?